The Ninja Ambush Trap is the Ambush trap with a non-removable blueprint skin applied to it. The stats are unaffected by the application of the blueprint skin. With a few small tweaks, the droids of the Ambush Trap become the SUPER NINJA GO-GO DEATH SQUAD!!! In our next episode, Super Ninja Robot Team must defeat more mice than ever before to prove their worth to their new owner. So be sure to tune in for: SERIOUS NINJA ROBOT AMBUSH! By the powers of Go-Go, they will punish you! The Ninja Ambush Trap is not sold by any Trapsmith. It can only be crafted given the proper ingredients. The blueprint can be purchased through the King's Cart at a cost of 195 King's Credits or from other players from the Marketplace. Blueprint skins are applied to the weapon by crafting it with the smashed trap parts. Unlike removable trap skins, the process is irreversible and the trap cannot be used to complete a few specific tasks in Library Assignments. Weapons with blueprint skins appear on the Hunter's Profile as a different item from their original counterparts and cannot be smashed with the Hunter's Hammer. Ambush – Identical statistics, but with no Trap Skin applied. 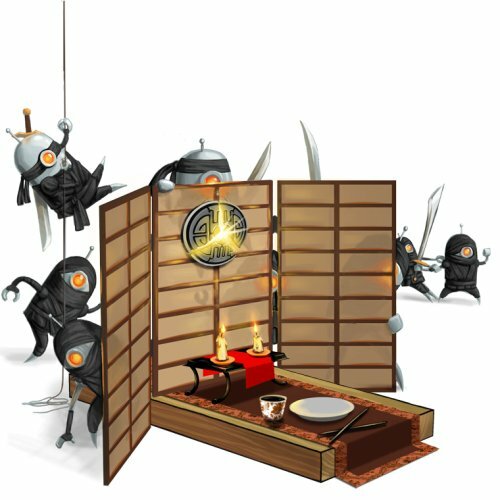 11 November 2010: The Ninja Ambush Trap was introduced with the release of the first Trap Skins during the King's Giveaway. The skin was also made available via Donations. 23 September 2011: The trap skin system was overhauled and the Ninja Ambush Skin was changed to the Ninja Ambush Blueprint. It was removed from Donations. This page was last edited on 13 January 2019, at 15:48.